The concepts of induced traffic and the triple convergence are vexing transportation phenomena that – when not acknowledged — mislead a great many people about what should and should not be done to correct transportation problems. Induced traffic and the triple convergence inform us that many travelers opt not to travel certain routes, opt not to travel at rush hour, or opt not to drive a car IF a route is congested. If the route is less congested (due to a widening of a road or intersection), those discouraged travelers “converge” back on the route, converge back on rush hour, and converge back on car travel. The road congests again, due to induced traffic caused by the triple convergence. And rather quickly. Unless the community is losing population. Another way of putting this is that in our world, there will pretty much always be a latent demand for more driving. Much of that demand is discouraged or diverted by congestion. Much of the discouragement goes away when the road becomes less congested. Roads are not like pipes carrying water. They are more like pipes carrying gas. Expand the pipe and the gas expands to fill the larger pipe. We cannot loosen our belts to avoid obesity. We cannot widen our way (or shift our form of travel) out of congestion. 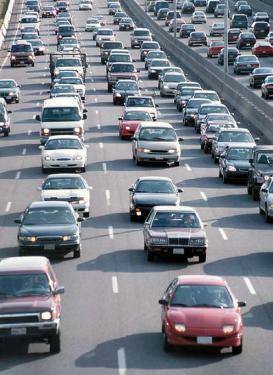 Commonly, it is claimed that traffic congestion increases emissions and fuel consumption. But Jeff Kenworthy and Peter Newman convincingly showed about 20 years ago that congestion decreases emissions and gas consumption, despite what we’ve always believed (one of the great many benefits of urban congestion). Why? Because as implied above, congestion imposes what Ian Lockwood calls a “time tax.” And “low-value” car trips (driving across town to rent a video at rush hour on a major arterial, for example) decline. The key is not to reduce congestion. Congestion is a sign of city vitality. A healthy city cannot (nor should it) reduce congestion. A healthy city must provide alternatives to congestion: convenient bicycling/walking/transit, compact development, pricing roads/parking, etc. And all of these healthy alternatives are much more likely, politically, when there is a lot of congestion. It is no coincidence that those cities with the worst congestion have the best transit. One reason that congestion in cities is our friend is that as Michael Ronkin notes, the most essential and effective way to reduce excessive car dependence (and promote walking/bicycling/transit) is to inconvenience cars. The most feasible way to inconvenience cars is to “let it be” when it comes to congestion. To not bankrupt ourselves and destroy our communities by widening roads/parking lots/intersections to reduce traffic/parking congestion.